Swedes are very proud of the fact that they are one of the most environmentally-friendly countries in the world. Generally, I agree – and this is coming from someone who has lived in the California Bay Area. 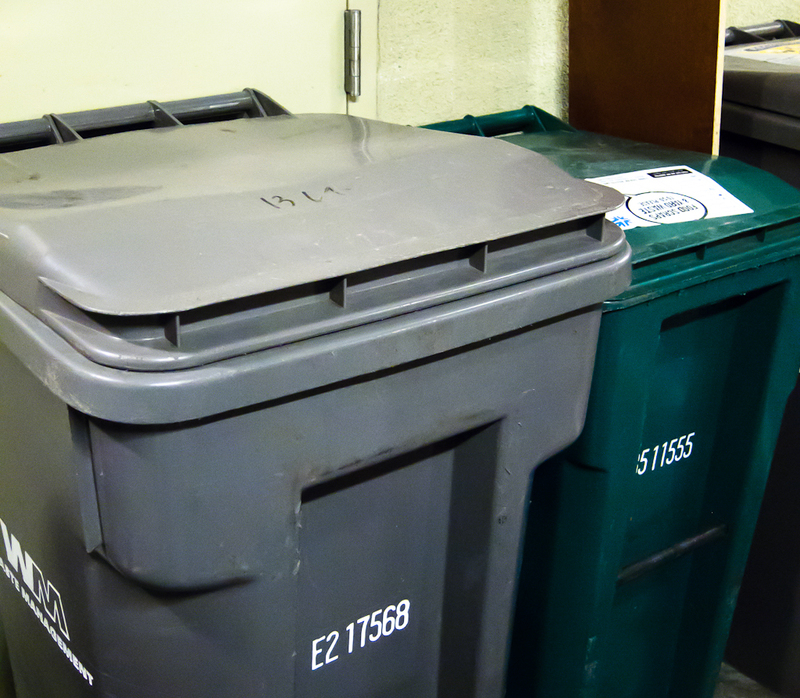 Bay Area residents have been recycling for decades, and those of us who live in the San Francisco and Berkeley areas know that the local City Councils are extremely supportive of recycling and other environmental issues. Did you know, for example, that grocery stores in San Francisco do not allow the use of plastic bags? They only give out paper bags or sell the reusable grocery bags. The picture featured on this blog are of two containers that are provided to every family: a recycling container and a compost container. In Sweden, we have recycling centers, everyone promotes lower electrical use, taxi companies have a large fleet of environmentally-friendly cars, we get to use a fantastic public transportation system (at least in Stockholm), and most important of all, everyone understands the importance of doing their part for the environment. So what is this blog entry about, really? It’s about the odd relationship that I have noticed between trash, recycling, and maintaining order. One Saturday, about 3 months into living there, I went outside to throw away the trash. I walked to the trash containers outside the apartment and opened them right as a family of four walked by. They were from the neighboring building and looked like they had just been at some formal function. I threw away my trash and started to walk back to my front door when the lady started speaking to me. She was speaking Swedish, but I had no idea what she was saying. I hadn’t learned the language yet. All I knew was that she was upset. Wow, right? She was right – I should have found the recycling center for the recyclables – but I thought her reaction to my using their trash containers was a little over the top. But that was her way of maintaining order in the community while promoting good environmental behavior. Just like when Swedes admonish those who cut in line or put their feet up on the subway seats, they also do their part in reminding others that recycling is an important part of being a good citizen. This entry was posted in Apartment, Culture, Recycling, TrulySwedish on April 23, 2011 by Kenneth Chen. The funny thing is, when I moved into that same apartment, I got the same guidance from the landlord. It was your story that convinced me to do it the right way. And in case you’re wondering, the recycling station is down the hill on Kampementsgatan across from the Coop.